Interest in spaghetti squash as a low-carb alternative to pasta has risen in recent years. This nutrient-packed veggie is an excellent source of beta-carotene and is high in both fiber and vitamin C. But that's not all. 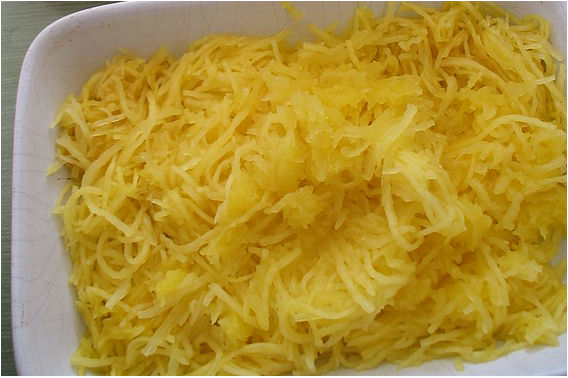 It is low in both carbs and calories, making spaghetti squash the dieter's dream. Learn how to grow, cook and serve spaghetti squash below. Spaghetti Squash has the same growing requirements as any other squash. They are easy-to-grow, but do require a lot of space as the vines sprawl for 10 feet or more. Make sure you choose an area where they have room to grow without interfering with other plants. Old-time gardeners often planted squash and pumpkins on the manure pile and let them sprawl over the pile, but unless you live on a farm, you will probably need to make other plans. Location: Choose a location that receives at least 6 to 8 hours of direct sunlight a day. While the number of hours does not need to be consecutive, they must add up to at least 6 hours for your spaghetti squash to perform well and produce abundantly. Soil: Squash prefers rich, well-drained soil with plenty of organic matter. Spread a 3- to 4-inch layer of compost, well-rotted manure or peat moss over the soil and work it into the top 6 inches of the soil, if you soil lacks adequate organic matter. Squash prefers slightly acidic soil with a pH between 5.5 and 6.8. To find your soil's pH or what nutrients you soil needs, test the soil before you plant. Fertilizer: Use a starter fertilizer such as 5-10-10 or 10-10-10 when planting and side dress your plants again when the first runners appear. Follow the application rate on the container and always work the fertilizer into the soil. Fertilizer can burn seeds and tender roots if applied too heavily or if it is not mixed into the soil well. Planting: Plant spaghetti squash seeds directly in the soil once the danger of frost has passed in your area. Seedlings should also be planted at this time. Space your rows 4 to 6 feet apart and plant 3 to 6 seeds in hills spaced 4 feet apart. Plant the seeds to a depth of 1/2 inch. Cover them with fresh soil and firm them down with your hands. Water the area well, and keep it slightly moist until the seeds germinate in 7 to 10 days. Watering: Water your squash when you notice signs of wilting or when the soil feels dry one inch below the surface. Water deeply to moisten the soil to the root level of the plants. Squash typically require 1 to 2 inches of rain a week - or watering once or twice a week during dry spells. Harvesting: Harvest spaghetti squash approximately 90 days after planting or when the rinds on the squash have hardened and the turned dark yellow or tan. 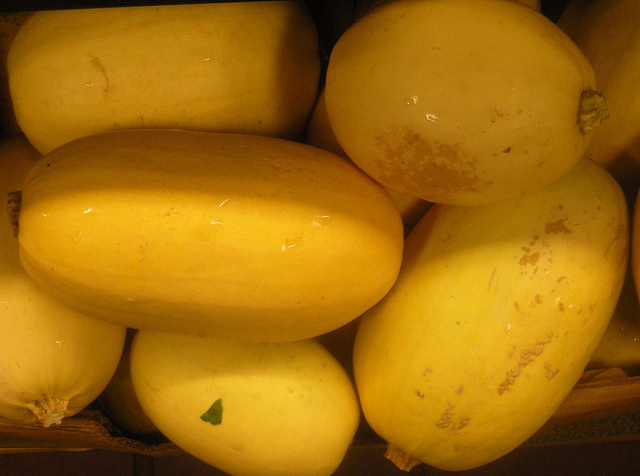 While most spaghetti squashes are yellow when ripe, some varieties are tan. To test the rind, try to cut the rind with your thumbnail. If it resists, the squash is mature and ready to harvest. The picture above is spaghetti squash that has been baked in the oven. This is the traditional method for cooking spaghetti squash. Follow these steps to bake or roast spaghetti squash. Cut the spaghetti squash in half with a heavy knife. While cutting it lengthwise is typically recommended, you can see from the picture here, cutting it the opposite way produces slightly longer strands of 'spaghetti' when it is done. Choose the method you prefer. Place the spaghetti squash cut-side down in a baking pan and add an inch or two of water, or line a baking sheet with foil and lay it directly on the foil. Bake it at 350 degrees F for approximately 45 minutes or until the squash is tender. Remove the pan from the oven and allow the squash to cool until it is cool enough to handle. Use a fork to pull the strands from the squash. Prepare the squash as you would for baking, by cutting it in half and removing the seeds. Place it cut-side down in a glass or microwave safe bowl. Cover the bowl with plastic wrap and cook on high for 8 to 12 minutes. Remove the strands with a fork. Some people prefer to cook the entire squash without cutting it. Of course, this does mean you need to remove the seeds after it is cooked, which can be a little messy. If you want to give it a try, here's how you do it. Wash and dry the squash. Add the whole spaghetti squash and boil for 20 to 30 minutes or until the squash is fork tender. Remove from the water and allow it to cool enough to handle. Pull out the strands with a fork. If you are a slow cooker fan, you'll love this neat trick for cooking spaghetti squash. Place the whole squash in your slow cooker or crockpot. Cook on low for 8 to 9 hours or until the squash is fork tender. Pull apart the strands of your spaghetti squash with a fork. 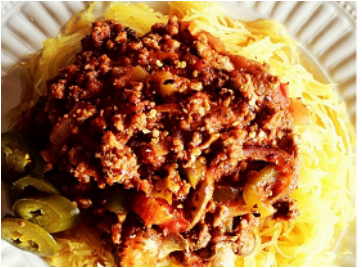 Many people enjoy substituting spaghetti squash for pasta and serving it topped with their favorite meat sauce, but you can also serve it topped with a little butter and salt and pepper, sprinkled with parmesan cheese or added to casseroles.